Detective Jacob Lev wakes one morning, dazed and confused: He seems to have picked up a beautiful woman in a bar the night before, but he can’t remember anything about the encounter, and before he knows it, she has gone. But this mystery pales in comparison to the one he’s about to be called on to solve. Newly reassigned to a Special Projects squad he didn’t even know existed, he’s sent to a murder scene far up in the hills of Hollywood Division. There is no body, only an unidentified head lying on the floor of a house. Like many others, I’m a big fan of Kellerman’s Alex Delaware novels and John Rubinstein’s narration. This book doesn’t belong on the same shelf. In fact, if not for Rubinstein’s always sterling performance, I would have returned it. Except, I kept thinking it would find it’s path and be worth the time. Not so. While it does bear Jonathan Kellerman’s name, I suspect his name is there only to help out his son’s writing career. In short, the story never made sense. The investigation was all over the place and the religious mythology only served to distract from the storyline. 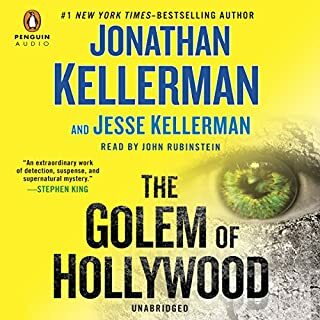 If you’re new to Jonathan Kellerman, skip this forgettable work and settle down with Alex Delaware. 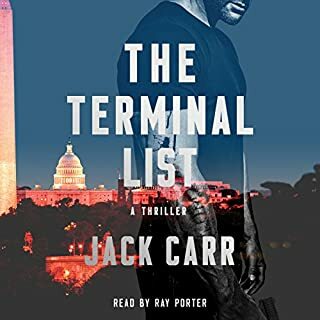 Make way for Jack Carr!!!! 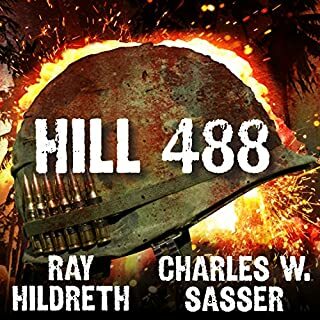 Ray Porter's narration is almost enough reason to listen to this book, but unfortunately, it isn't. Porter does an excellent job of trying to keep this reactionary and humdrum piece of revenge from sinking in its own muck. The problem isn't so much the overall narrative arc, as there have been any number of good revenge novels, but the repetition of jingoistic memes including the constant reminders of the values of family, pregnant wives, military buddies, and the awfulness of liberals who apparently want to undermine the actions of real warriors, such as banning waterboarding. Authors are allowed to express their political viewpoints, I don't mind that. However, when it interferes with a strong and growing narrative, believable multi-dimensional characters, and a fresh take on a well-visited subject matter, then it's time to jettison the political POV and concentrate on engaging the listener with a solid story. On June 13, 1966, men of the 1st Recon Battalion, 1st Marine Division were stationed on Hill 488. Before the week was over, they would fight the battle that would make them the most highly decorated small unit in the entire history of the US military, winning a Congressional Medal of Honor, four Navy Crosses, 13 Silver Stars, and 18 Purple Hearts - some of them posthumously. The Vietnam war and it's disastrous impact on American society still lingers today. I lived through those times and unlike the authors of this book, I was opposed to our involvement in this cruel and senseless crusade. But I was drawn into the personal world of these young men, teenagers actually, who went off to fight for Uncle Sam armed with ignorance, naivety, and the echo of heroic but fictional WWII movies filling their thoughts. We are drawn into the lives of a small group of Marines who encounter an unbelievable onslaught that challenges many misconceptions of what it meant to fight and die in the jungles of this distant land. It's an intelligent and insightful piece accompanied by superb narration. It paces well and builds well and most significantly, reduces the rhetoric of Vietnam to human fears, determination, and perseverance. All in all, a remarkable book. A soldier returns from the front line of battle to report that Pekkala's charred body has been found at the site of an ambush. But Stalin refuses to believe that the indomitable Pekkala is dead. On Stalin's orders, Pekkala's assistant, Kirov, travels deep into the forests of Western Russia, following a trail of clues to a wilderness where partisans wage a brutal campaign against the Nazi invaders. Unknown to Kirov, he is being led into a trap. 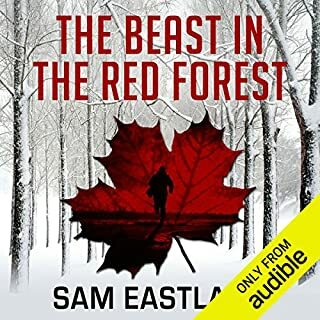 Where does The Beast in the Red Forest rank among all the audiobooks you’ve listened to so far? This is the 3rd book in the series that I've listened to. It's been a compelling story telling adventure. But this one has been let down by the new narrator. Whoever decided to change the narrator from the earlier books made a big mistake. Mr. Pacey isn’t bad, he just doesn’t have the same rhythm, range, or style. I had planned on listening to more of the Pekala mysteries, but with Pacey performing, I think not. Frank Machianno is a late-middle-aged ex-surf bum who runs a bait shack on the San Diego waterfront. An affable Italian with a love of people and life, he's a stand-up businessman, devoted father, and a beloved fixture in the community. He's also a hit man - specifically, a retired hit man. 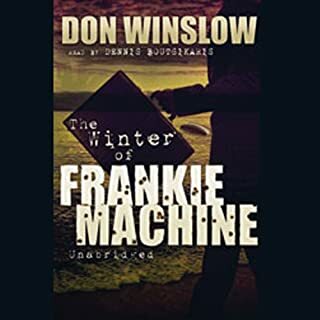 Back in the day when he was one of the most feared members of the West Coast Mafia, he was known as Frankie Machine. If you're a fan of the film Goodfellas, you'll be a fan of this excellent tale of made guys, surfer dudes, and sunny San Diego. The narration does sound like Ray Liotta in the film, and that's to it's benefit. A great ride with a wiseguy who actually one can root for. Another great read from Don Winslow. Lawyer Andy Carpenter's true passion is the Tara Foundation, the dog rescue organization he runs with his friend Willie Miller. All kinds of dogs make their way to the foundation, and it isn't that surprising to find a dog abandoned at the shelter one morning, though it was accompanied by a mysterious anonymous note. But they are quite surprised when they scan the dog's embedded chip, and discover that they know this dog. He is the "DNA dog". Boy, this series just gets better and better! 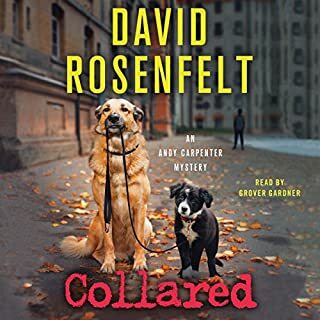 Would you consider the audio edition of Collared to be better than the print version? Can't answer that, I haven't read the book. Ultimately, disappointing. Not up to the author's previous works. Have you listened to any of Grover Gardner’s other performances before? How does this one compare? He's consistently a great reader. Certainly the best part of this book. The story seemed more contractual than original. I've enjoyed all of Rosenfelt's earlier &quot;Tara&quot; novels, but this one was disappointing. He seems to have a checklist that he or his publisher had him mark off. Mostly the ending was a let down. Maybe he's getting tired of writing the same book with different bad guys. Winter 1945. Seven months after the Nazi defeat, Munich is in ruins. Mason Collins - a former Chicago homicide detective, US soldier, and prisoner of war - is now a US Army criminal investigator in the American Zone of Occupation. It's his job to enforce the law in a place where order has been obliterated. And his job just became much more dangerous. The author picked a really interesting period in history, the immediate aftermath of the collapse of Nazi Germany. While the surrounding environment makes for interesting details, the basic plot is, at best, mediocre. Without giving away the story, I would say that the author went with the most cliched plot line - hunting for a serial killer. Out of all the possibilities of setting a crime story in post-war Germany, he settled for one which could have been told in contemporary LA, Chicago, or St.Louis. 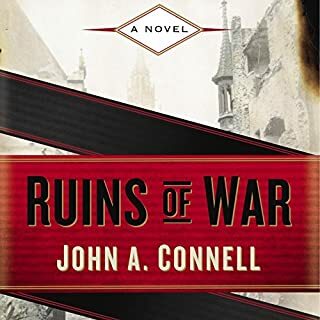 What was most disappointing about John A. Connell’s story? The serial killer. What again? Another twisted mind doing carnage, this time with a nod to the horrific atrocities committed by Nazi doctors in the death camps. Connell trivializes these horrors to tell a tale which, unfortunately, feels tired and so cliched. What three words best describe Rob Shapiro’s performance? Why do so many contemporary crime/mystery writers feel compelled to reduce everything to hunting a serial killer? It's boring and has been done to death. While the author picked a fascinating, and largely unexplored time, to set his story, he drops the ball by creating a routine driven cop vs sadistic madman scenario complete with dense bureaucratic boss whose only purpose is to frustrate the protagonist. Spoiler alert -- just like any average B movie thriller, the character has to surrender his badge at the end of act II and pursue the killer all on is own. Wow. Never thought of that. 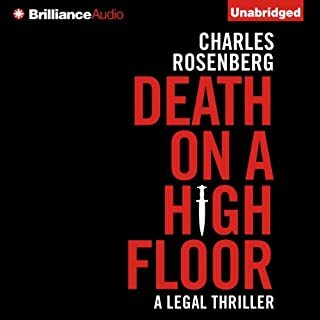 On the 85th floor of a glittering high-rise in Los Angeles, Robert Tarza steps into the lobby of the Marbury Marfan law firm to discover his partner Simon Rafer lying in a pool of blood - an ornate dagger plunged into his back. Robert had worked with Simon for decades, and their relationship was fraught with conflict. But he never imagined he would wind up as the prime suspect for his colleague’s murder. As the evidence stacks up against him with frightening speed, he quickly falls from his respected position to that of a criminal dragged through the tabloids. This is my first Audible experience with this author, and probably my last. While the narration was professional and engaging, the story itself turned out to be less than the sum of it's parts. My biggest disappointment was the totally anti-climatic climax. The story didn't peak so much as just end. After devoting many listening hours I expected a payoff worthy of the investment. Sorry, not there. Really. Also the main character, a successful lawyer, repeatedly took actions that belied what we're supposed to believe about him. In other words, the author had him take actions that were dumb just to be able to move the plot forward. Berlin, early 1948: The city, still occupied by the four Allied powers, still largely in ruins, has become the cockpit of a new Cold War, and as spring unfolds its German inhabitants live in fear of the Soviets enforcing a Western withdrawal. Here, as elsewhere in Europe, the legacies of the War have become entangled in the new Soviet-American conflict, creating a world of bizarre and fleeting loyalties, a paradise for spies. John Russell works for both Stalin’s NKVD and the newly-created CIA. He does as little for either as he can safely get away with. A turgid tale told with little enthusiasm. Would you try another book from David Downing and/or Michael Healy? I have read all of David Downing's previous "station" books and I'm afraid this last one went off track. It seemed tired and narratively listless. This lethargic storytelling was amplified by the nearly somnabulistic narration. It lacked excitement, enthusiasm, or engagement. It's the first book I've listened to read by Michael Healy, and it will be the last. The concept could have been interesting, however, the extremely flat reading defeated whatever drama the writer tried to imbue in the pages. It could have had some variation which expressed the underlying subtext. As it is, it is without a doubt the most boring performance of any audio book I've yet encountered. 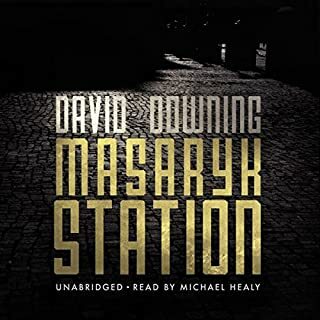 Do you think Masaryk Station needs a follow-up book? Why or why not? Put the series to sleep. If this current version is any reflection of Downing's current work, then he needs to find something new to pursue. 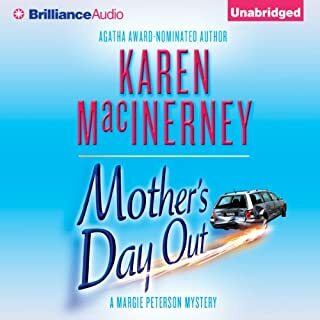 With a husband who works long hours trying to make partner and two rambunctious kids that are running her ragged, Margie Peterson is like any other worn-out suburban mom. When she decides to take a job as a PI for a seedy local detective agency, everything changes. It doesn’t take long for Margie to get in over her head: Her first day on the job she totals her minivan, mistakenly enters a drag contest, and winds up in the bathroom with a dead transvestite. But when Margie finds her home number in the victim’s phone, things really start to get interesting. If Janet Evanovich's Stephanie Plum got married, had two kids, and surrounded herself with trite, mundane characters she might end up in this book. I'm a big fan of the Plum series, and I could see room for another take on the female fish outta water, but this book doesn't pull it off, even though it really, really wants to. Perhaps Austin Tx. doesn't have the same pool of fun characters as Trenton, NJ, or the author missed what humor she could plum from the character's world. Or perhaps in this case imitation isn't the sincerest form of flattery, it's just imitation. Maybe the character needs to be a little smarter, a little sharper, a little more unique. There's room for growth, but I won't be staying around to see where it goes. What three words best describe Cris Dukehart’s performance? Was Mother's Day Out worth the listening time? Not terrible, a few funny scenes, just not worth the time.